Talks between club and the city are said to be advanced and may bring another world class stadium to London. Its cost may stand at some GBP 200 million, according to London Evening Standard. QPR today confirmed what the club announced already two years back – the plan for new 40,000-seat stadium is still being pursued. More importantly, it seems to be advancing with the club's new home possibly becoming part of the Old Oak Common redevelopment scheme. OLD Oak Common is an industrial site of some 100 acres, north of Loftus Road and south of Wembley. Plans are in place to build offices and 19,000 homes there, along with major railway hub, which would help Rangers’ chances of boosting their fanbase and filling the ground. It has been reported that negotiations with Hammersmith and Fulham council and the Greater London Authority are at an advanced stage, although it will take several years for the building scheme to be carried out. Rangers will be asked to contribute £200m to the venture but money should not be an issue as AirAsia owner Fernandes and the wealthy Mittal family are part of the hierarchy. 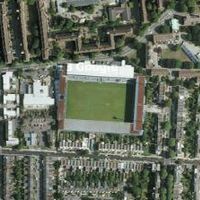 The club would also be able to raise funds from the sale of Loftus Road, which should command a large fee given that it is in west London and can be used to build properties on.